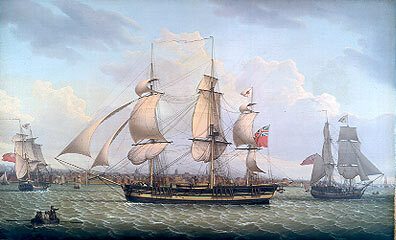 The unknown ship-rigged vessel in the center is powerfully armed, 8 guns to the side. She is probably a privateer, a privately armed vessel licensed to take prizes. Salmon’s knowledge of the details of seafaring is exemplified here. Liverpool is laid out carefully, something common in his paintings. Shipboard activity is precise and accurate down to the goat aboard Phoenix to provide milk and eventually fresh meat. Phoenix was American built in 1801.